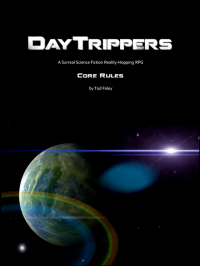 I've been asked to explain how the surreal sci-fi RPG DayTrippers - with its collaborative/interpretive action resolution system and narrative arc model - can be considered "OSR". Certainly those things don't sound very "old-school". Indeed, the action resolution system in DayTrippers is based on a Narrativist technique, and the whole idea of working within a narrative arc is more Modern than Trad. At first glance, these things might make DayTrippers seem decidedly "new-school". That's especially true when we consider the Core Rules alone. 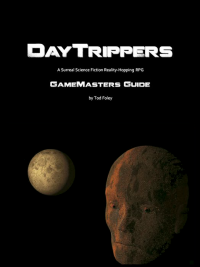 But the DayTrippers GameMasters Guide is a different sort of animal - a blend of traditional and modern techniques - producing high-prep, high-bleed adventures, designed to be run by Auteur GMs. Within the pages of this book, DayTrippers meets the OSR. Let's see how it stacks up against a classic definition of the term. OSR games tend to rely on GM rulings, rather than cut-and-dry rules or situation-specific rolls. Like Finch says, that's why there are so few numbers on the character sheet, and so few specified abilities. A few Stats and a few Skills - loosely interpreted and generously applied - are all you need. Thinking outside of the box is the norm. No matter what weird idea the Players have, there is a simple mechanic for the GM to grab and extrapolate a ruling from. For Players, this means problems will tend to be solved creatively, using observation, reasoning and experimentation. No two traps (or solutions) are alike. In DayTrippers, this concept is layed out right at the start: Players are told to consider their skills as broadly as possibile. Quoting from the Core Rules book: "Characters can use Skills in all sorts of creative ways, whether or not those uses are generally considered 'part of' the Skill. The Skill of Prestidigitation, for instance, might be used for pickpocketing. Swimming Skill might be used to hold your breath in a toxic atmosphere. Don’t hold back. Use your Skills creatively and interpret them broadly. The GM can assign a DL (Difficulty Level) to any weird thing you can imagine, so it’s really about the fiction that the Skill permits. Sure, the Level measures how good the PC is at using that Skill, but the creative ideas and applications of that Skill will come from you." This is the way character definition works in DayTrippers as well. While DayTrippers are definitely a bunch of weirdos - who else would risk life and limb to disappear into alternative universes - they're still normal people in terms of their capabilities, and they always will be. After scores of sessions and character advancements, having gained hundreds of experience points and visited dozens of worlds, your PCs might attain intergalactic fame and notorious wealth but they'll never be gods. That's part of what makes their successes so exciting. Looking back over these four key traits, hallmarks of the OSR, we find that DayTrippers exhibits three of them. While the narrative structure and psychological approach of the game are definitely new and strongly influenced by Narrativist designs, there's plenty here for an old-school GM to sink their teeth into. If you're a trad GM who wants to take their gaming group to a more collaborative level, or if you're interested in applying narrative structures to your trad gaming sessions, or if you just love rolling up things on random generators, I think you'll feel both comfortable and inspired by what you find in the pages of the DayTrippers GameMasters Guide. Psychic Content. Vertical Control. Sketchy Prep. High Bleed. You've played like this before. You've just never seen rules for it.